A cyclone is a tropical storm with a rotating, organized system of clouds and thunder-storms that originates over tropical or subtropical waters. When the storm reaches maximum sustained winds of 74 miles per hour or higher, it is classified as a hurricane, typhoon, or cyclone depending upon where the storm originates. Hurricanes are more deadly and cause more damage than any other type of storm, with the largest releasing energy equivalent to 10 atomic bombs per second. Today’s hurricane-tracking computers are 50 percent better at predicting the paths of tropical storms and hurricanes than they were in 1990. This improvement has increased warning times, enabling large-scale evacuations and allowing more time to protect property in a storm’s path. However, the same quarter-century has seen almost no progress in predicting how strong a storm will be when it makes landfall. One reason is that the innermost core of a hurricane, down near the ocean surface, remains hidden from the view of weather satellites. 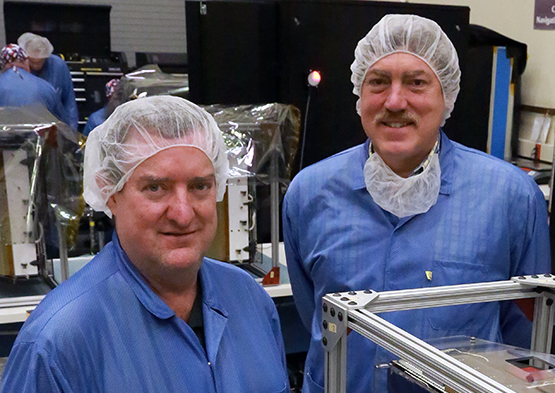 With more than 32 years of expertise developing space systems, John Scherrer (right) serves as mission project manager of CYGNSS, overseeing the development, launch, and operation of the eight microsatellites. Alan Henry (left) brings 20 years of experience to managing the assembly, integration, and testing of the CYGNSS constellation. Like a home satellite TV system that loses programming due to “rain fade,” most weather satellite-borne radar signals can’t “see” through the thick clouds and heavy rains of a tropical storm. Measuring the movement of ocean waves beneath the hurricane could provide valuable clues to what drives the genesis of the hurricane as well as its wind speed and storm surge potential. But up to now, those measurements simply weren’t possible. Researchers and engineers at Southwest Research Institute (SwRI) and the University of Michigan expect all that to change with NASA’s Cyclone Global Navigation Satellite System (CYGNSS), scheduled to launch in late 2016 or early 2017 from Cape Canaveral Air Force Station in Florida. Because CYGNSS focuses on tropical weather, it can gather more frequent and timely data on the particularly intense weather spawned in the tropics. For the first time in its long history of involvement in NASA space missions, SwRI designed, fabricated, and integrated the CYGNSS constellation of eight microsatellites. 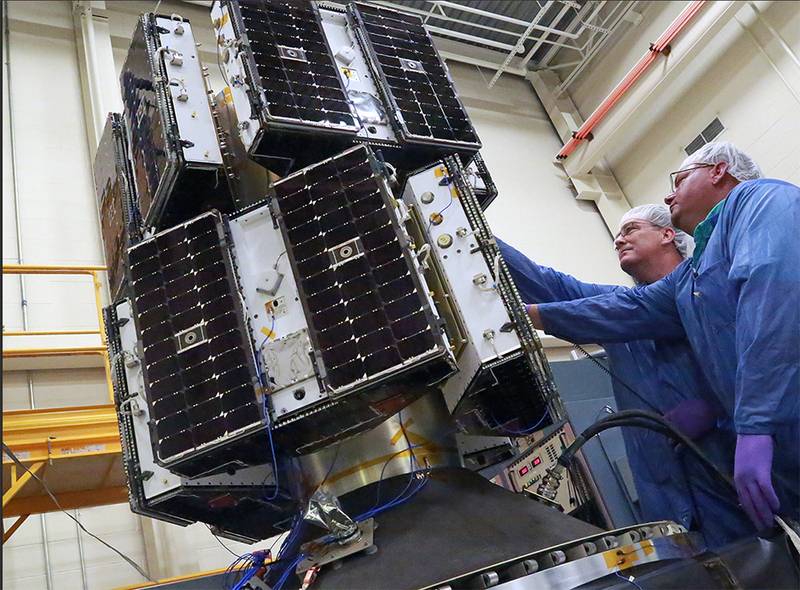 Assembly of the CYGNSS microsatellites began a year ago, in August 2015. For each microsatellite, the SwRI team integrated multiple components and subsystems, including many that were developed at SwRI for other space programs. Following assembly, technicians inspected interfaces and tested each system’s function. Then the satellites were subjected to environmental testing, including evaluation in SwRI’s electromagnetic and radio frequency facilities. With so many systems and subsystems in such a small package and the hyper-sensitive CYGNSS GPS receiver, this evaluation was particularly critical to ensure that the operation of one component didn’t interfere with another. Then the spacecraft underwent thermal vacuum tests in a new SwRI chamber that simulates the environments encountered in space. This new chamber, much larger than other similar SwRI facilities, allowed four spacecraft to be tested together, saving months in the overall project schedule. Satellite in launch (left) and orbit (right) configurations. After thermal vacuum testing was completed in August 2016, the satellites were moved to SwRI’s mechanical test labs and installed on the deployment module for vibration testing and subsequent post-environmental separation testing. Because the flight package — the deployment module plus the eight satellites — was so large, SwRI upgraded its vibration facility. Each satellite packed for launch measures roughly 20x25x11 inches, slightly larger than a standard carry-on suitcase. 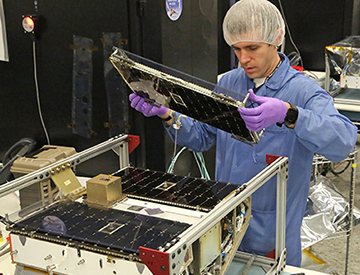 Fully assembled, each satellite weighs about 64 pounds and, when the solar panels are deployed, has a wingspan of 5.5 feet. A hurricane can be 300 miles in diameter and reach 40,000 to 50,000 feet up into the sky. The largest storms can generate wind speeds in excess of 160 miles per hour. Achieving the resolution needed for real-time remote sensing of tropical storms has been frustrated by technology limitations and high costs. However, recent gains in modeling techniques, plus the development of microsatellite technology using lower-cost commercial off-the-shelf equipment, make it possible for CYGNSS to provide science measurements to hurricane watchers at a level of detail never before available. Each microsatellite carries a GPS bi-static radar receiver. CYGNSS won’t produce its own radar signals, but rather will receive reflected signals from the extensive constellation of GPS satellites already in orbit. Just as they can measure small distances on the ground, the reflected GPS signals can sense the height of ocean waves with considerable sensitivity. When waves change rapidly and heights vary greatly, the signal reflections become scattered. The degree to which they are scattered yields valuable information about wind speed and direction, based on how much the wave action has distorted the GPS signal. The process is similar to what a photographer sees when taking a picture of a scenic mountain lake. On a calm day, the mountains are reflected with almost mirror-like clarity. But if it’s windy, waves on the lake blur the reflection of the mountains. CYGNSS will measure the amount of scatter in the reflected GPS signals. A perfectly calm ocean would yield a pinpoint-like reflection, but a storm-ridden ocean would scatter the signal’s reflection into a blurry “glistening zone.” CYGNSS bases its hurricane intensity findings on the size and behavior of these glistening zones. The GPS- reflecting instruments measure these zones and compare them to known parameters of winds and sea swells. When the signals are processed, the scattering becomes the source of an information-rich dataset for weather forecasters. SwRI is designing, fabricating, and integrating the CYGNSS constellation of eight microsatellites. 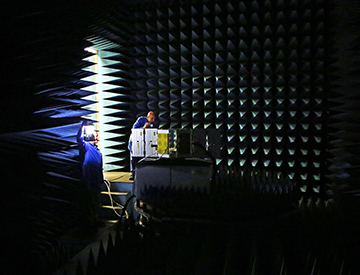 The satellites were subjected to environmental testing, including evaluation of electromagnetic compatibility (EMC) and interference (EMI) in SwRI’s EMI/EMC and radio frequency facilities. In SwRI’s new, larger thermal vacuum chamber, the CYGNSS spacecraft were cycled through the extreme hot and cold temperatures they will face in orbit. Hurricanes can generate in excess of 2 trillion gallons of rainfall per day, thwarting some space-borne measurements of ocean winds. The signal attenuation from heavy rain is associated with the radar frequency that most weather satellites use. Different radar bandwidths vary greatly in their ability to penetrate heavy precipitation. For example, weather satellites that use the C- and Ku- radar bands are heavily attenuated or even completely blocked by heavy rain. However, even the highest rainfall rates have only a negligible effect on the L-band radar frequency used by GPS satellites. Using L-band radar provides a double benefit that was a major factor in the CYGNSS system design. Measuring reflected signals of existing GPS meant the satellites didn’t need to produce their own radar signals, avoiding the cost, complexity, and power demands of eight onboard radar broadcast systems. The small, low-power design means all eight microsatellites can be placed in orbit with a single, cost-effective Pegasus rocket. Hurricanes affecting the continental United States are most likely to form from June to November, when seas are the warmest. Upon landfall, strong winds, heavy rains, and waves can cause widespread devastation associated with the storm surge. Ninety percent of fatalities are associated with flooding. The radar detection instruments aboard the CYGNSS constellation will create mapping images representing ocean surface roughness, which is directly related to the surface wind speed. Each microsatellite produces a map image of a GPS radar reflection point at a rate of up to four images per second. Wind speeds are derived from measurements of signal reflections covering 15.5 square miles of ocean surface. Together, the eight CYGNSS satellites can produce 32 wind measurements per second. The satellites will downlink data via the Universal Space Network remote antenna sites located in Australia, Hawaii, and Chile. From there, data will be routed to the SwRI Mission Operations Center in Boulder, Colorado, for initial processing. Then, they will be forwarded to the Science Operations Center at the University of Michigan in Ann Arbor, Michigan. Meteorologists will use data to generate windspeed maps, graphs, and charts detailing the formation and intensity of cyclones and hurricanes. 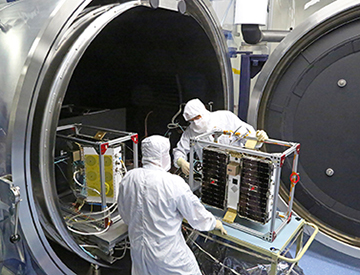 SwRI engineers prepare NASA’s eight Cyclone Global Navigation Satellite System (CYGNSS) microsatellites, mounted on the deployment module, for vibration testing. CYGNSS will launch this winter, allowing scientists about six months to adjust the satellite spacing and calibrate the onboard instruments in anticipation of the 2017 hurricane season. The constellation will cover the Earth’s historically active hurricane region as the eight microsatellites sweep high above the tropics. Once they have been positioned evenly around the world, the spacecraft are expected to continue operating with minimal course adjustments throughout the two-year primary mission. Ultimately, CYGNSS data will be shared with the National Oceanic Atmospheric Administration to improve hurricane intensity models and help emergency managers make decisions regarding weather-related plans, such as evacuations. The Space Physics Research Laboratory at the University of Michigan College of Engineering leads the overall mission execution, and its Climate and Space Sciences and Engineering Department leads the science investigation. The Earth Science Division of NASA’s Science Mission Directorate oversees the mission. Questions about this article? Contact SwRI Solutions.